Friday not long past 1 p.m. things were hoppin' at the North Coast Resource Center in Arcata. Outside, a gang of gulls and ravens hopped up and down, screeching and scrapping for bread chunked at them by a man on the sidewalk. Another guy waved an empty plastic bottle at a big spotted dog, who leaped for it; when his teeth clamped onto the bottle, they played crackly tug-o-war. Several others hanging about joked and laughed and smoked, and people regularly entering the building left arms laden with huge boxes of food: milk, macaroni, tuna, Hamburger Helper, tofu, oranges, zucchini and other goods donated by various markets around town. Inside, everything seemed busy as usual -- it would be hard for someone who didn't know better to guess that this was the last day of operation for the NCRC until it finds more funding (which could be a month or longer). Almost all of the chairs set up in the front waiting room were full. Volunteer Mike Wynn helped a young woman fill out paperwork to get assistance. Board president Derk Schulze was in a back office doing paperwork. John Shelter, recently deposed NCRC executive director who volunteered his time the past 18 months here, was just getting back from an errand. Somebody had just dropped off a $500 donation -- OK, that was an unusual event. Volunteer Donald LaPointe cleaned up the lunch mess in the kitchen. Several folks sorted produce, picking out the rotten stuff. 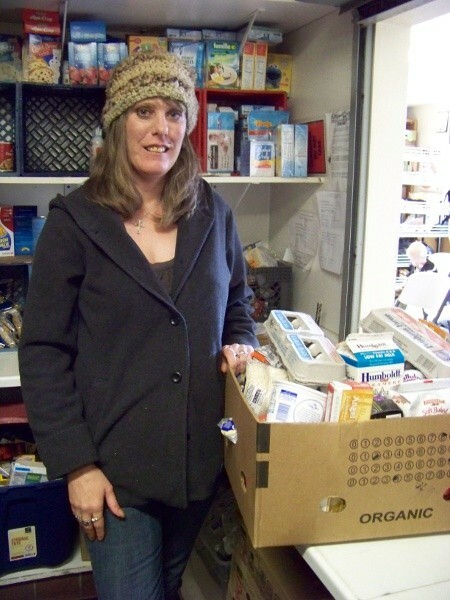 Volunteer Lisa Rozelle rapidly and genially filled clients' food boxes; one client, Michele, said usually she's on the donating end of things here, but today, because she'd been laid off from her job, she was on the receiving end. That's the way the NCRC functions. If you want food, or other assistance that the NCRC provides, you've got to do something: clean, cook, organize book shelves, sort fruit and vegetables, fill boxes, and more. Rozelle said she and her husband, when they found themselves homeless, came immediately to the NCRC. "We loved the idea that John [Shelter] allowed us to work for our food," she said. "Because I grew up in a house where, 'No work, no food.'" Where will everyone go tomorrow? Some don't know yet; they're still grieving. Some say they'll wait ands see if the NCRC opens up again. Some will find work or volunteer gigs elsewhere. Some are going with Shelter to help him turn his New Directions program into an independent organization -- using homeless work crews to engage directly with homeless people in their camps, teach them to clean up after themselves, and ultimately help them become housed, employed and self-sufficient. That's the plan, anyway. We'll have more news on Shelter's new direction, and hopefully an update on the NCRC's fate, in an upcoming issue of the Journal.